Even if you don’t have space for a garden, window boxes make it easy to add color or grow herbs and vegetables conveniently. 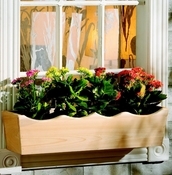 Give your home a natural, colorful appeal with a beautifully maintained window box. Make your home look like a fairy tale. Window boxes are the epitome of sweet and romantic, creating the perfect space to enjoy the lively colors of flowers even without having to be outside. You can fill window boxes with your favorites, or use them to grow herbs and vegetables even without a garden space. And there’s no need to bend over, pull weeds, or deal with difficult harvesting. You can take care of your plants right from your own window. 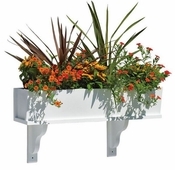 With so many options, you’ll find the perfect window boxes for your home. 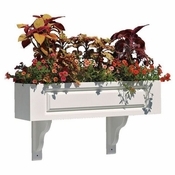 Millwork City offers a huge variety of window boxes made from many materials. 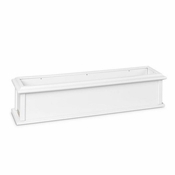 The quintessential white window boxes can be ordered in P.V.C., cedar, and bead board, and may include brackets or not, depending on your style. We also have window boxes with copper details, and in a beautiful natural wood if you want a unique and rustic look. Choose window boxes that match the style of your home for the easiest, and most useful, detail you can add to a home’s exterior.